To check your workplace and personal pensions, you can look at your annual pension statements or log in to your online accounts. If you’re not sure who's managing your pensions and aren't receiving regular statements, you may need to track down your pensions. It’s important to check your pension to make sure you’re saving enough for retirement, you understand the fees you’re paying, and you’re happy with how your pension is being invested. If you have workplace pensions, and/or private pensions, you should receive statements each year showing you how much money is in your pension pots and how your investments are performing. Some pensions - including PensionBee pensions - come with online accounts. This means you can log in to your account to check your pension any time, just like you check your bank balance from your online banking portal. If you have a PensionBee pension, your online account is called your BeeHive, and from here you can see your pension balance. You can also see a list of recent transactions in your activity log and check the historic performance of your investments. Our pension calculator can also help you see if your retirement saving is on track. You may struggle to check your pensions if you can’t remember your providers are, and if you’re no longer receiving pension statements because your pension provider doesn’t have your current address. In this case, the first step to checking your pensions may be to find your pensions! There are several ways to do this, including contacting your old employers or using the government’s Pension Tracing Service. If you want to combine your pensions into a PensionBee plan, we can help to locate and transfer your old pensions. There’s more information on finding your lost pensions on our ‘how can I find my pensions?’ page. As well as any workplace and personal pensions, you may be eligible for a State Pension. This is a regular payment from the government that you can receive when you reach State Pension age, based on your National Insurance record. The maximum state pension is currently £168.60 per week (2019/20). If you’ve got a while until retirement, it’s quite difficult to predict how much state pension you’re likely to receive, as future governments may make further changes to the State Pension. However, you can use the State Pension forecast tool on the government’s website to check how much State Pension you could get, when you can get it, and how you may be able to increase it. PensionBee combines your old pensions into a new plan that you can manage easily online. You can see your current balance and contribute to your pension in a few clicks. PensionBee plans are managed by BlackRock, State Street Global Advisors, HSBC and Legal & General, four of the biggest investment managers in the world. You’ll only pay a single annual fee. 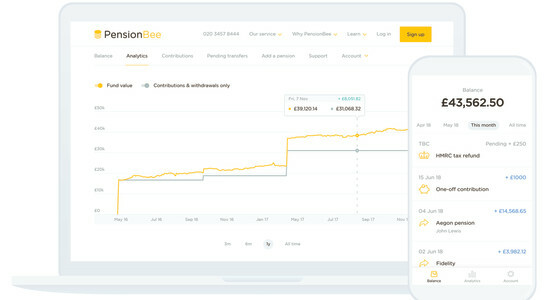 Plus existing customers can download our app in the iTunes and Google Play stores, and use it to access their real time pension balance with PensionBee. Find out more about the PensionBee plans.